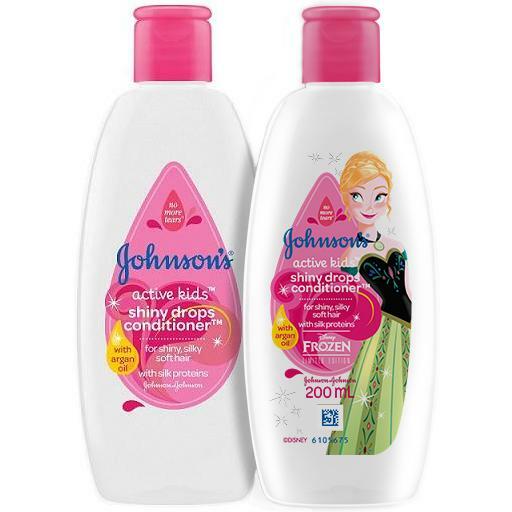 Make conditioner time more magical with Disney's Frozen, while stocks last. Johnson’s® understands that as a child grows, hair also changes. And that’s why it needs its own special care! The mild and effective Johnson’s® Active Kids Shiny Drops Shampoo and Shiny Drops Conditioner formulas were developed to work together to boost natural shine and help reduce frizz, leaving hair silky smooth and healthy looking. After shampooing, dispense a small amount of Johnson’s® Active Kids Conditioner unto palm and gently work downward through the hair. Rinse thoroughly. For better results, use with Johnson’s® Active Kids Shiny Drops Shampoo.